Anales Inst. Biol. Univ. Nac. Mexico 32: 151, Fig. 7. 1961. TYPE: Mexico. Oaxaca: near Yella (San Mateo Yetia? ), January 14, 1959, MacDougall 410 (MEXU, holotype). 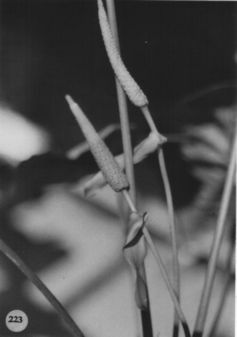 Terrestrial; stems ca. 30 cm long, 3.5 cm diam., green; internodes short; roots thick, tan, pubescent, directed downward; cataphylls subcoriaceous, 7-9 cm long, tinged red-violet, rounded at apex, acumen apiculate, subapical apiculum 2-5 mm long, drying brown, persistent, splitting at base, the apex intact. LEAVES erect-spreading; petioles 28-45 cm long, 4-7 mm diam., terete, heavily tinged red-violet in early stages; geniculum 2.3-2.5 cm long, weakly sulcate; blades broadly ovate to rounded, moderately thick, gradually long-acuminate at apex, deeply lobed at base, 20-44 cm long, 15.5-29 cm wide, broadest at point of petiole attachment or slightly above; anterior lobe 15-29 cm long, the margins rounded; posterior lobes 7-15 cm long from apex of sinus to outermost point; sinus obovate to campaniform, sometimes closed, acute at apex; both surfaces matte to semiglossy, lower surface much paler; midrib convexly raised above, flat at apex, acutely raised below; basal veins 4-5 pairs, first and second free, third to fifth coalesced 2.5-3 cm, raised in valleys above, raised below; posterior ribs ± straight, inner margins sharply rolled up; primary lateral veins 4-6 per side, departing midrib at 40¡-50¡ angle, curving toward apex and joining collective vein, sunken above, raised below; interprimary veins flat above, prominulous below; lesser veins scarcely visible; collective vein arising from the first basal vein, sunken above, raised below, 7-12 mm from margin. INFLORESCENCE erect-spreading, shorter than leaves; peduncles 18-20 cm long, 4-5 mm diam., terete, green heavily tinged with red-violet, one third to one half as long as petioles; spathe coriaceous, green tinged with red-violet, broadly lanceolate, 7.5-9 cm long, 2.5-3 cm wide, broadest at base, acuminate at apex, subcordate at base, inserted at 45¡ on peduncle; stipe 2-2.5 cm long in front, 1.5-1.8 cm long in back, 5 mm wide, green tinged with red-violet; spadix green (B & K Yellow-green, 6/7.5), 8-8.2 cm long, 1.2-1.5 cm diam. at base, 7-9 mm diam. at apex; flowers rhombic to 4-lobed, 3-3.2 mm long, 4-4.5 mm wide, the sides sigmoid; ca. 5 flowers visible in the principal spiral, ca. 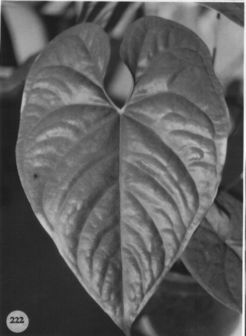 7 flowers visible in the alternate spiral; tepals matte, weakly punctate, densely and minutely papillate, lateral tepals ca. 2.3 mm wide, the inner margin straight; pistils emergent, weakly raised, green; stigma linear, nearly obscure; lateral stamens emerging from base to apex, rapidly followed by third and fourth, exsertcd on short, translucent filaments; anthers yellow, ca. 0.5 mm long, 0.3 mm wide, held in a contiguous circle over pistil then retracting and opening at edge of tepals; thccac ellipsoid, scarcely divaricate; pollen yellow, fading to white. INFRUCTESCENCE pendent; berries dark orange, ovoid, 1.2-1.5 cm long, 1.2-1.4 cm diam., rounded at apex with 4 faint ridges; seeds 2, green, 1-1.3 cm long, 7-8 mm thick, markedly flattened on one side. Figs. 222 and 223. Anthurium yetlense is endemic to Mexico in the Sierra de Juare/- in northern Oaxaca. It is known only from the area south of Valle Na-cional from 600 to 1,500 m in wet cloud forests.The species is a member of section Belolonchium and occurs with and is similar to A. umbrosum. Both species are terrestrial; however, A. yetlense diners from A. umbrosum in that the inflorescence is much shorter than the leaves and the leaf is broadly ovate rather than ovate-triangular. The spadix of A. yetlense is green at anthesis whereas the spadix of A. umbrosum becomes violet-purple. Mexico. Oaxaca: near Yetia (San Mateo Yella), MacDonall410(MEXU); between Valle Nacional and Oaxaca. W of Valle Nacional, Croat 39768 (MO).